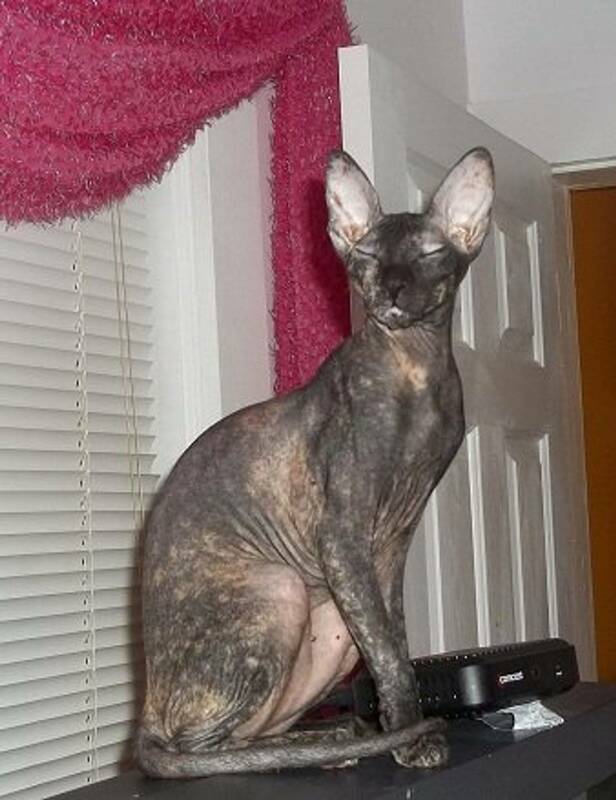 The Don Sphynx (Donskoy) originated in 1987 from a cat in the city of Rostov-on-Don. Helena Kovalyova ran off some boys kicking a cat in a pillow case. She took the cat home and noticed that its coat was lacking fur. She tried medical treatments with noticeable change. She then decided to breed the cat with a European Shorthair male. Four healthy kittens were born, two which carried this sparse phenotype. Irina Nemykina acquired a kitten from this first litter and started a breeding program. That is when the Don SPHYNX became an entity. It's main characteristic is its lack of hair. It was registered in the World Cat Federation as a breed in 1996. Unlike the Canadian Sphynx, the gene occurring from this spontaneous mutation is the dominant gene and is the first truly hairless cat. The Don Sphynx (Donskoy) are elegant, sturdy with strong boning. They are a soft hearted good natured social cat that is active, friendly and highly intelligent. They are a very affectionate and loving animal. The PETERBALD breed was created at the end of 1994 in St. Petersburg, Russia as the result of experimental mating of a Don Sphynx male called Afinogen Myth and an Oriental Shorthair female World Champion Radma von Jagerhov, by a well known Russian felinologist named Olga S. Mironova. The first two litters gave four peterbald kittens: Mandarin iz Murino, Muscat iz Murino, Nezhenka iz Murino and Nocturne iz Murino. These four peterbalds are the founders of the breed. Originally the name "Sphynx" was attributed to hairless cats, bred on the basis of the mutation revealed in Canada. Canadian mutation is appointed to a recessive allele - hr. Specimens that are homozygous for this allele (hrhr) do not always display hairlessness in it's full expression. Sometimes they have a thin residual coat with a corrupted texture that is more prominent on the legs, muzzle and tail (these are so-called Points). 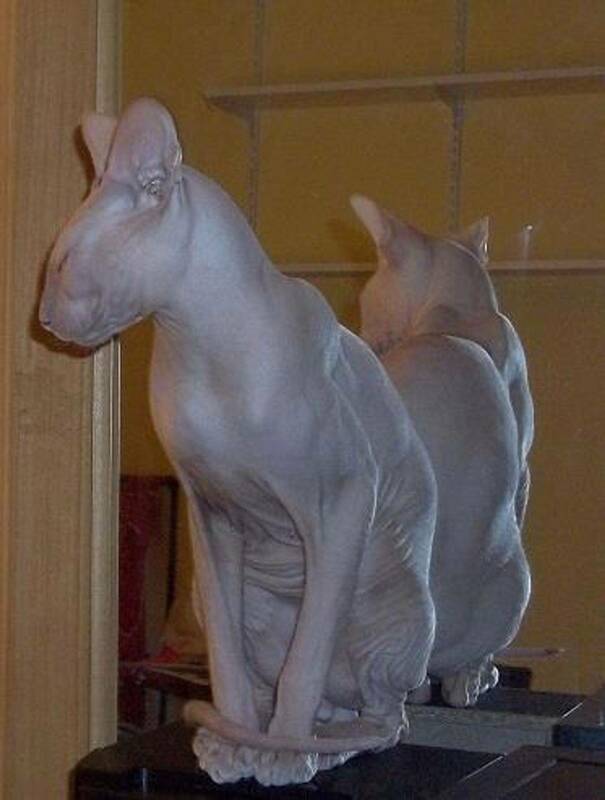 The Russian mutation the Don Sphynx & the Peterbald behaved in some other way. It revealed itself as early as the first generation from two cats - normal and hairless. The results of such mating re quite mixed. Some heterozygous offspring had a residual curly coat, which could be extremely short ("velour") or of normal length but rare, and shafts of hair were thin. These coat texture abnormalities often came together with a bald spot on the crown. These kittens lost their coat as they grew older - hair bulbs died on some regions or on all surface of skin (except for points). The "shedding" happened in the period from two months to three years of age.Other heterozygous kittens were born with thick curly hair of normal length staying coated for life. These animals are called "brush".Among the second generation, animals from both "shed' parents or one "brush" and one "shed", were born completely "Hairless at Birth". Their elastic large skin was wrinkled and some had no whiskers.The most evident Don Sphynx feature is reduced growth (which also correlates with the coat development) "hairless" and sometimes "velour" animals grow noticeably slower than their "coated" siblings. In the adult age they are virtually the same size. This kind of "hairlessness" also influences the cat's behavior. GENERAL: all colors and patterns, in any combination, found in felines is acceptable in the Sphynx with exception to any of the colors or patterns that are determined by the placement of color on the single shaft of hair. e.g. shaded, cameo, smoke, chinchilla, ticked or otherwise tipped hair shaft. Being a cat noted for its lack of hair, these descriptions would not apply to the Sphynx. Note: exposure to sun will intensify all colors. WHITE: white to pink. Nose leather and paw pads: pink. BLACK: black. One level tone from nose to tip of tail. Nose leather: black. Paw pads: black or brown. BLUE: blue. One level tone from nose to tip of tail. Nose leather and paw pads: blue. RED: deep, rich, clear, brilliant red, without markings. Lips and chin the same color as the skin. Nose leather and paw pads: brick red. CREAM: one level shade of buff cream, without markings. Nose leather and paw pads: pink. CHOCOLATE: rich chestnut brown, even throughout. Nose leather: brown. Paw pads: brown or cinnamon. LAVENDER: frosty-grey with a pinkish tone, even throughout. Nose leather and paw pads: lavender-pink. FAWN: pale, pinkish fawn, even throughout. Nose leather and paw pads: pale fawn. MACKEREL TABBY PATTERN: markings clearly defined on legs and tail. Pattern tends to fade on hairless body. Legs evenly barred with narrow bracelets coming up to meet the body markings. Tail barred. Necklaces on neck and chest distinct, like so many chains. Head barred with an "M" on the forehead. Unbroken lines running back from the eyes. Lines running down the head to meet the shoulders. Spine lines run together to form a narrow saddle. Narrow pencillings run around body. SPOTTED TABBY PATTERN: markings on the body to be spotted. The spots can be round, oblong, or rosette-shaped. Any of these are of equal merit but the spots, however shaped or placed, shall be distinct. Spots should not run together in a broken Mackerel pattern. A dorsal stripe runs the length of the body to the tip of the tail. The stripe is ideally composed of spots. The markings on the face and forehead shall be typically tabby markings. Underside of the body to have "vest buttons." Legs and tail are barred. Markings clearly defined on legs and tail. Pattern tends to fade on hairless body. PATCHED TABBY PATTERN: a patched tabby (torbie) is an established silver, brown, blue, red, cream, etc. tabby with patches of red, cream, lavender, fawn, etc. clearly defined on both the body and extremities; a blaze on the face is desirable. SILVER TABBY: skin ground color, including lips and chin, pale clear silver. Markings dense black. Nose leather: brick red. Paw pads: black. BROWN TABBY: skin ground color brilliant coppery brown. Markings dense black. Lips and chin the same shade as the rings around the eyes. Back of leg black from paw to heel. Nose leather: brick red. Paw pads: black or brown. BLUE TABBY: skin ground color, including lips and chin, pale bluish ivory. Markings a very deep blue affording a good contrast with skin ground color. Nose leather: old rose. Paw pads: rose. RED TABBY: skin ground color red. Markings deep, rich red. Lips and chin red. Nose leather and paw pads: brick red. CREAM TABBY: skin ground color, including lips and chin, very pale cream. Markings buff or cream sufficiently darker than the ground color to afford good contrast but remaining within the dilute color range. Nose leather and paw pads: pink. CHOCOLATE (Chestnut) TABBY: skin ground color is warm fawn, markings are rich chestnut brown. Nose leather: chestnut, or pink rimmed with chestnut. Paw pads: cinnamon. CHOCOLATE-SILVER TABBY: skin ground color, including lips and chin, is silver. Markings rich chestnut. Nose leather: chestnut or pink rimmed with chestnut. Paw pads: cinnamon. CINNAMON TABBY: skin ground color, including lips and chin, a pale, warm honey, markings a dense cinnamon, affording a good contrast with skin ground color. Nose leather: cinnamon or coral rimmed with cinnamon. Paw pads: cinnamon. CINNAMON-SILVER TABBY: skin ground color, including lips and chin, a pale glistening silver. Markings dense cinnamon. Nose leather: cinnamon. Paw pads: coral. LAVENDER TABBY: skin ground color is pale lavender. Markings are a rich lavender, affording a good contrast with skin ground color. Nose leather: lavender, or pink rimmed with lavender. Paw pads: lavender-pink. LAVENDER-SILVER TABBY: skin ground color, including lips and chin, a cold clear silver. Markings lavender. Nose leather: lavender or pink rimmed with lavender. Paw pads: lavender-pink. TORTOISESHELL: black mottled or patched with red and/or cream. Blaze on face desirable. BLUE-CREAM: blue mottled or patched with cream. Blaze on face desirable. CHOCOLATE (Chestnut) TORTOISESHELL: rich chestnut brown mottled or patched with red and/or cream. Blaze on face desirable. CINNAMON TORTOISESHELL: cinnamon mottled or patched with red and/or cream. Blaze on face desirable. LAVENDER-CREAM: lavender mottled or patched with cream. Blaze on face desirable. FAWN-CREAM: fawn mottled or patched with cream. Blaze on face desirable. VAN CALICO: white with unbrindled patches of black and red confined to the extremities; head, tail, legs. One or two small patches of color on body allowable. DILUTE VAN CALICO: white with unbrindled patches of blue and cream confined to the extremities; head, tail, legs. One or two small patches of color on body allowable. VAN BI-COLOR: solid color and white, tabby and white, tortoiseshell and white, etc., with color confined to the extremities; head, tail, and legs. One or two small patches on body allowable. FAWN-CREAM CALICO, LAVENDER-CREAM CALICO, CINNAMON-CREAM CALICO: as for calico above, with appropriate marking color. FAWN-CREAM VAN CALICO, LAVENDER-CREAM VAN CALICO, CINNAMON-CREAM VAN CALICO: as for van calico above, with appropriate marking color. POINTED PATTERN: point restricted colors show little or no color contrast between body and points in the mature Sphynx. Although born very light in color, the pointed Sphynx will darken and appear solid in color as an adult. Eye color: vivid blue. Nose leather and paw pads: appropriate to coat color. The pointed pattern may be combined with ANY other pattern (except mink) and ANY colors, e.g. lilac-silver lynx point and seal-tortie point with white (shown in the Bi-Color Class). MINK PATTERN: point restricted colors show little or no color differentiation between body and points in the mature Sphynx. Although born very light in color, the mink Sphynx will darken and appear solid in color as an adult. Eye color: aqua. Nose leather and paw pads: appropriate to coat color. The mink pattern may be combined with ANY other pattern (except pointed) and ANY colors, e.g. natural mink, blue mink, champagne mink, platinum mink, natural tabby mink, blue-cream, tortie mink and white (shown in Bi-Color Class). SABLE: the mature specimen is a rich, warm, sable brown without shadings, barring, or markings of any kind. (Kittens are often lighter in color.) Nose leather and paw pads: brown. CHAMPAGNE: the mature specimen should be a warm honey beige without shadings, barring, or markings of any kind. Nose leather: light, warm brown. Paw pads: warm, pinkish tan. PLATINUM: the mature specimen should be a pale, silvery gray without shadings, barring or markings of any kind. Nose leather and paw pads: lavender-pink. OSC (Other Sphynx Colors): any other color or pattern. Cats with no more than a locket and/or button do not qualify for this class, such cats shall be judged in the color class of their basic color with no penalty for such locket and/or button. Examples: any color with one, two, three, or four white feet. All point restricted colors such as seal point, chocolate point, natural mink, blue mink, sable, champagne, platinum, etc. SleekatsCattery 2004 All Rights Reserved.